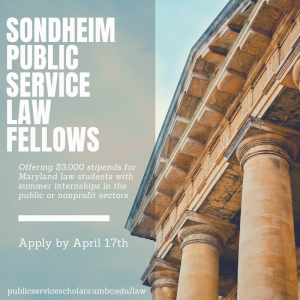 The Walter Sondheim Jr. Public Service Law Fellowship is offered to students attending either of Maryland’s two law schools, The University of Maryland Francis King Carey School of Law and the University of Baltimore School of Law. Fellows intern in the public service law sector, usually within the Office of the State’s Attorney, the Maryland Attorney General’s Office, or in a nonprofit or government organization which assists in providing legal services to low-income or under-represented individuals or groups. Fellows are paid a $3,000 stipend.